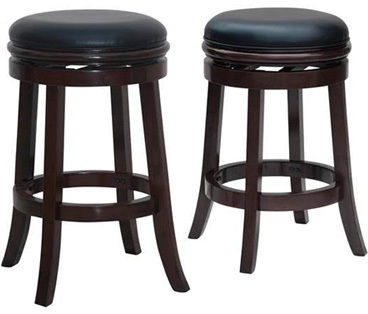 If you’re looking for a backless stool, stop right now! The Boraam Backless Stool is what you’ve been looking for! Featuring a ball bearing steel three hundred and sixty degree swivel plate, solid hardwood and high density foam seat cushion. The Boraam Backless Stool adds style to your home with its meticulously carved seat apron, flared legs and handsome finish and single welt cord trimmed upholstery. Complete your home today with the Boraam Backless Stool!